Kozhi ada / Savory meat pockets is a Malabar muslim crisp delicasy, Kerala hot crispy snack . Though it looks very similar to the North Indian sweet snack Gujia, both tastes different. Kozhi ada means a savory crisp pocket filled or stuffed with spiced chicken / kozhi. During Ramadan, most of the food stalls on the road side will sell this hot crisp kozhi adas and for me the name itself makes me drool here. A must try delicasy of Malabar. In my opinion, the best way to taste the Malabar cuisine is during Ramadan. All traditional popular snacks will be displayed in most of the food stalls during ramadan. As am from Malabar, this sight makes me nostalgic. Kozhi ada is the most popular and authentic snack of malabar which is a native of Koilandy (near calicut). In olden days, homemade hot pockets was prepared with sun dried meat for the purpose of long shell life. 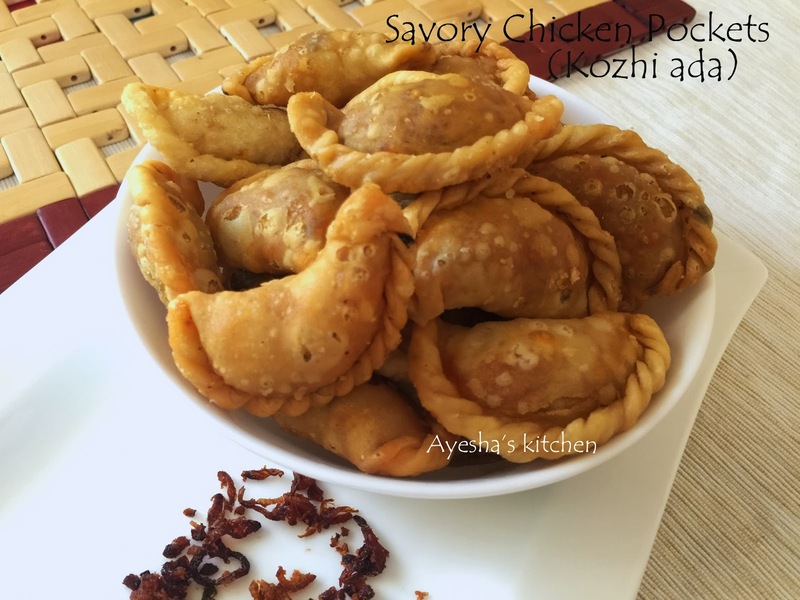 Kozhi ada / chicken pockets is also prepared with coconut and sugar filling flavored with cardamom powder which is called as sweet ada. For storing long, the filling must be very dry and crunchy. I still remember my mom used to say that it was prepared mainly for the newly wedded groom by his mother in law as an evening snack in olden days. I love to prepare this in bulk as its shelf life is one month or more and no refrigeration needed too. It is not like samosa preparation, as the filling and the crust will be more crispier for long shelf life. 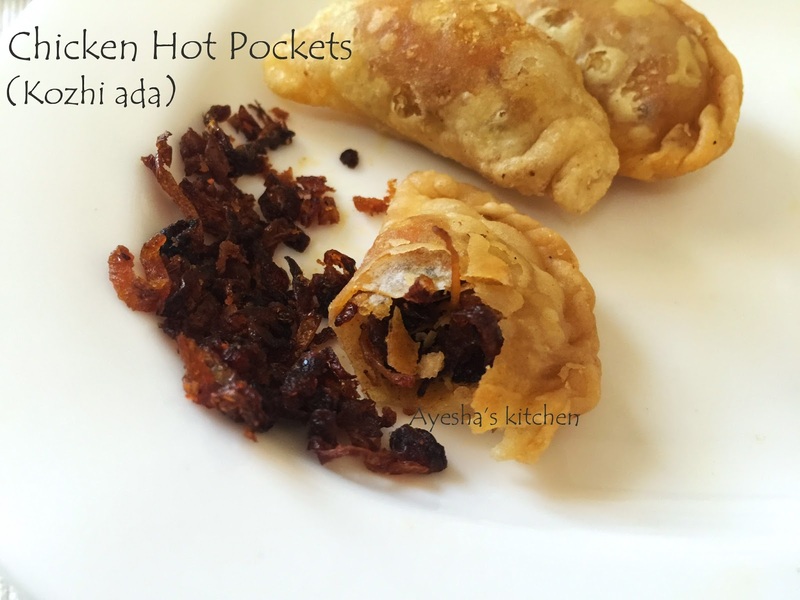 So lets see how to make homemade hot pockets recipe / malabar kozhi ada / meat pockets with chicken. Combine together flour, salt, ghee very well and add warm water little by little and make a soft dough like chapatti dough. Set aside with closed lid for one hour. Now cook the chicken with turmeric powder, chili powder, ginger garlic paste, and salt until tender. When done, shred the chicken pieces with your hands into strands. Set aside. Now heat oil in a pan (2 tbsp). Add chopped onions, green chilies and curry leaves. Saute until the onion start getting golden brown. Now add the shredded chicken and cook on low flame until the chicken is fully dry and powdery. It must be crisp and not like samosa filling which is semi wet filling. Finally add garam masala powder and check for salt. Now take a small disc shaped dough and put the filling in one end and cover it with the other end. Press both the sides together with fingers and pinch the edges together in a pattern to get the crescent shape. If not, take a fork and press the edges with that teeth of the fork which gives you a fine texture. Keep aside and continue making the kozhi adas (chicken pockets)till the filling is finished. Heat oil in a wok and when hot , add the kozhi adas (meat pockets)one by one (do not add more , four at a time) . Deep fry on a medium low heat till golden brown. If the heat is high, only the outside will be cooked and not inside. And if it is on low flame, the whole adas will be a soggy with oily texture. So always fry on a medium low heat . It should be crispy and crunchy to stay long. Drain the excess oil and enjoy the crispy snack with a nice cup of tea.